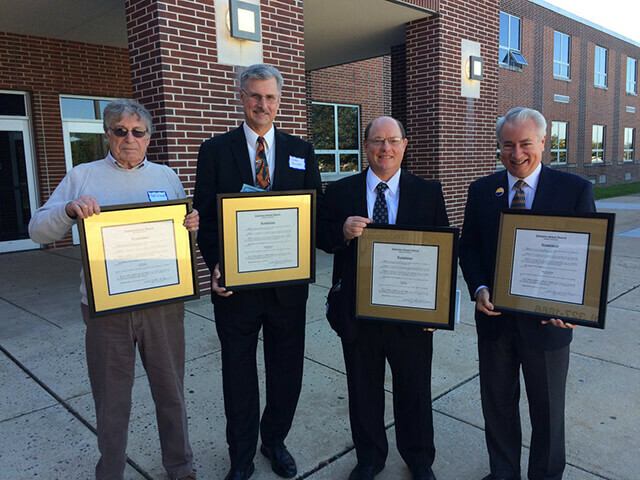 The Pottstown School District Alumni Honor Roll announces the 2017 honorees, Robert Smale accepting for his brother Jim Smale, Terry Zeigler, Jim Kerr and Bruce Moyer. This was the 32nd Annual Alumni Honor Roll Induction Ceremony which recognizes Alumni from the Pottstown School District who have distinguished services as an individual or as a member of a group making a substantial contribution in his/her chosen business, profession, or military career or has exerted a positive influence in the civic and/or religious life of a community. The induction ceremony is held during an assembly at the Pottstown High School for the students in the hope of motivation current students in striving for excellence. This year’s ceremony was held on Friday October 20, 2017. After the induction ceremony, the honorees and guests attended a luncheon at the Brookside County Club. Terry Zeigler, PSD Class of 1972 founded his own company, Data Cap Systems which develops and manufactures integrated electronic payment systems. He serves this company as the President and CEO. As co-founder of the Zeigler Family Foundation he helps oversee the foundation’s efforts to develop and implement financial literacy programs to local school districts. He and his family have endowed the Zeigler Institute for Professional Development at Bloomsburg University. He and his wife have endowed the College of Business at Bloomsburg University which has been renamed The Zeigler College of Business. Jim Kerr, PSD Class of 1981 started his career in journalism at the Mercury in Pottstown. He became a reporter and eventually was promoted to copy editor and then city editor. During his tenure at the Mercury, Jim was recognized numerous times at the local and state level with awards for his coverage of the Pottstown community. Jim then moved to the Reading Eagle where he started as copy editor and over the past 19 years has held various positions with the newspaper. He is most proud of the fact that as a member of the press he has had the opportunity to tell the stories of the people in his community, to record history, make a difference, and be the voice of those who otherwise might not be heard. Bruce Moyer, PSD Class of 1970 is an attorney and lobbyist in Washington DC. He has served both in private and governmental organizations for more than 40 year. As President of the Moyer Group, a consulting company in Washington DC, he had advised and trained clients in the art and science of advocacy. His area of expertise is in the administration of justice and law enforcement in government operations, including the U.S. Postal Service. Jim is the recipient of many professional and civic awards and is the author of numerous articles on government, law, and politics.